Mark Snyder’s plays include Lila Cante, Corsets, Wipe Away, The Beanbag Game, Lilith on Today, and The Sounds of Ice. His new play, As Wide As I Can See, will have a staged reading this month in New York for At Hand Theatre, where he is an Artistic Associate. 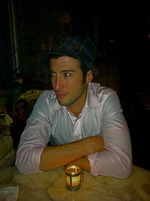 For three summers, he hosted and performed in Red Light Nights at New York’s The Slipper Room (Firecracker Productions). His plays have been produced and developed in New York, Chicago, San Francisco, and Portland. His interviews and essays have appeared in The New Gay, Queerty, ThePeeq, and at Maud Newton.com, and he has read new work at Pete’s Candy Store (courtesy of the2ndHand.com) and throughout downtown NYC. Mark was born in Warren, Ohio and received his BA, Otterbein College and MFA, Ohio University. At Hand Theatre will present a staged reading of Mark's play As Wide As I Can See on Sunday, January 23 in New York City at 7pm at Shelter Studios (244 West 54th Street, 12th Floor). 2. Who's the one person you haven't worked with that you would like to? There are some really fantastic actors who are primarily known as musical theater performers that are mind-boggling good in plays, like Michele Pawk in Adam Bock’s beautiful play A Small Fire at Playwrights Horizons. I have a couple of younger musical theater actors who don’t immediately spring to mind when casting for a straight play who I think would be really interesting. Otherwise, I stay pretty flexible - I just love discovering the play with talented artists who are also good people. 3. What's the best advice you've ever received? My first writing professor Dr. Jim Bailey took me very seriously as a writer, and he always challenged me to keep my nose to the grindstone, to keep working, to not settle on the easy way to tell a story. He also made sure he had some juicy gossip to keep me coming back! I try to write every day, which I think can be very important in terms of the flow and structure of one’s life, and to figure out what engages me emotionally and physically about a play and to hold on to that kernel throughout the writing of it. 4. If you couldn't be doing what you are doing now, what career would you choose? I would move to Portland and work two part-time jobs: one as a chef at an organic produce-based restaurant and one as Powell’s bookstore employee, preferably in the biography section. At night, I would front my folk-punk cover band Prerequisite Homo. Our encores would consist of forgotten Fleetwood Mac songs.